Need a faceless, heartless enemy for players to be able to mow down without guilt? Zombies are perfect for that, says Guild Wars creator Jeff Strain - which is why his new Undead Labs is making a zombie apocalypse MMOG. Yesterday, it was announced that Guild Wars creator Jeff Strain - former lead programmer on World of Warcraft at Blizzard - had founded a new studio called Undead Labs with the intent of creating a true zombie-apocalypse-survival MMOG for consoles. Which, if I may interject my own humble opinion, is an awesome idea. 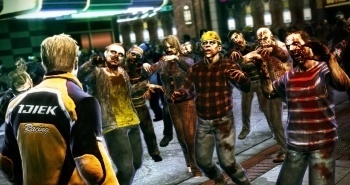 Speaking with Eurogamer, Strain offered his thoughts on why zombies were the new enemy du jour with games like Dead Rising and Left 4 Dead - because when gamers go through a title slaughtering hundreds of opponents, they need a foe they can murder en masse without feeling guilty about it. "The reason zombies are so powerful and transcend fantasy is because right now they are the modern, societal guilt-free meat-puppet ... We've been through the Nazi phase, we've been through the communist phase, we've been through the terrorist phase. Those were all at various times in history fair game in the gaming culture. Right now zombies are fulfilling that need for us. That no-rules, no-guilt mentality is something that people really resonate with." In other words, when you kill a zombie you don't have to feel guilty that you just deprived a family of their father figure. Which makes sense, I suppose. Strain did not, however, share his feelings on the idea of Nazi Zombies.